Cherry Winks Cookies A Classic Cookie is a recipe that won the Pillsbury Bake Off® Contest in 1950. This recipe was submitted by Ruth from Rice Lake WI. I have wanted to make this recipe for as long as I can remember. 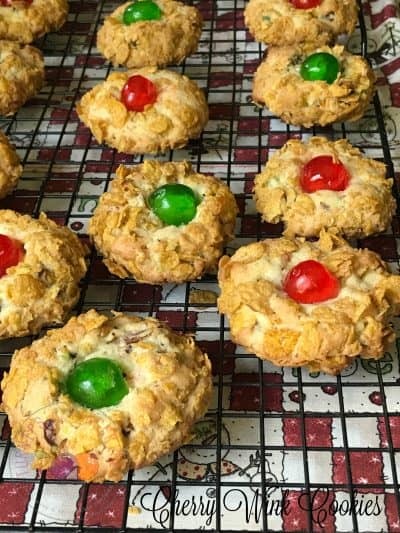 This recipe can be seen on many Christmas cookie trays during the holidays. It’s not a cookie I grew up with nor have I ever made this cookie for my own kids, so I think it’s high time I made these cookies! 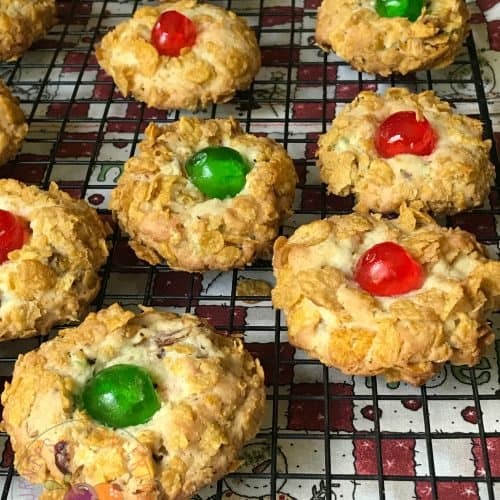 This cookie recipe is filled with an assortment of ingredients. The ingredients are blended together and are transformed into these sweet, crunchy cookies. Made with chopped hazelnuts or pecans, chopped dates, (we used Medjool) and chopped candied cherries. The cookie batter is formed into balls and, this is my favorite part, rolled into coarsely crushed cornflakes. 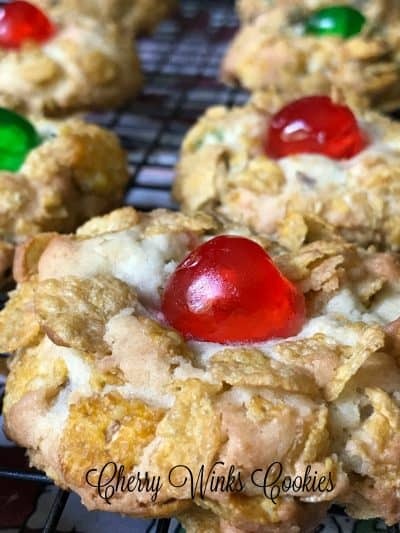 The cornflakes give the cookies a nice crispy crunch that I love. 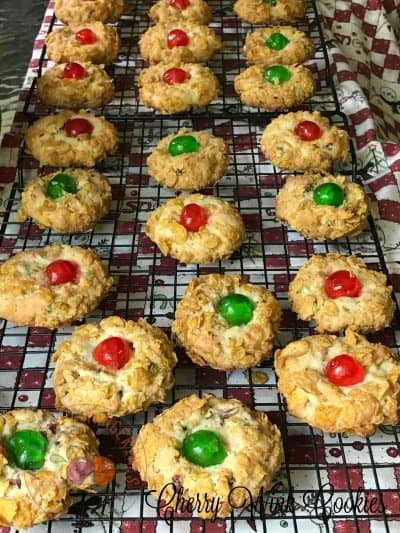 I decided to make these cookies using Paradise red and green candied cherries instead of the maraschino cherries called for in the original recipe. 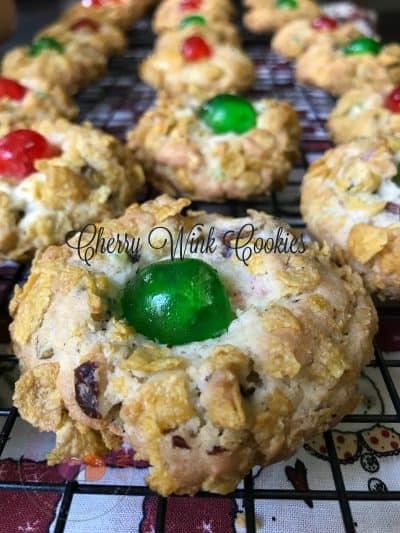 Using red and green candied cherries brought a festive touch to this recipe and therefore will be the perfect addition to your Christmas cookie tray this holiday season. You can also make this recipe and use all red candied cherries for Valentine’s Day and all green for St. Patrick’s Day. Fun! Fun! One bite of these cookies and you’ll be hooked. Crispy on the outside, thanks to the cornflakes and tender on the inside. Each bite contains a small piece from the candied cherry. Seventy years later, Cherry Wink Cookies are still popular. I bet Ruth D. never thought that her recipe would have become so popular, for so long. I’d also bet that Ruth would be proud of herself for making a cookie that has definitely stood the test of time. Cherry Winks Cookies are a true classic cookie since 1950. In large bowl, beat sugar and shortening with electric mixer on medium speed, scraping bowl occasionally, until well blended. Beat in milk, vanilla and eggs. On low speed, beat in flour, baking powder, baking soda and salt, scraping bowl occasionally, until dough forms. Stir in hazelnuts, dates and 1/3 cup chopped red and green candied cherries. Cover with plastic wrap and refrigerate 15 minutes for easier handling. Heat oven to 375°F. Spray cookie sheets with cooking spray or use a silicone mat. Drop dough by rounded teaspoonfuls into cereal; coat thoroughly. Shape into balls. Place 2 inches apart on cookie sheets. Lightly press a cherry halve, cut side down, into top of each ball. alternating colors. This recipe was submitted in 1950, into the Pillsbury Bake® Off Recipe Contest by Ruth D. from Rice Lake WI. Ruth won the contest and the rest is history. This is the same recipe Ruth submitted with the exception of two changes. I used chopped hazelnuts for the chopped pecans and for the chopped maraschino cherries we substituted candied green and red candied cherries from Paradise Fruit Co.
Cherry Stollen is another great recipe using candied cherries.